In this day and age, everyone is looking for ways to save more money. A number of Americans have also realized the importance of protecting our environment. When it comes to your home, there is an often overlooked opportunity to save money over the long term and even get some tax relief. You should contact a roofing contractor in Menlo Park to learn more about this. All this can be done just by switching to metal roofs instead of the traditional composition roof. This article will show how investing in metal roofs can benefit your wallet as well as your home. Tired of receiving insanely expensive electricity bills each month? Using a metal roof can help you dramatically cut your monthly energy bill. In some cases, you can save up to 40% on your energy bill. This is significant, given the fact that Americans spend more that $40 billion per year to keep their buildings cool. If everyone used metal roofing, it could have a tremendous impact on our energy use as a nation. The traditional composition roofing, which is made primarily from asphalt, tends to absorb most of the sun’s heat. This can make your attic as well as the rest of your house much hotter, which requires you to use your air conditioner far more than you would if the heat wasn’t being absorbed. This is where the metal roof comes in. 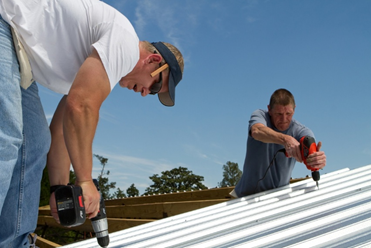 The advantage of metal roofing is that it doesn’t absorb the sun’s heat. It reflects a very high percentage of the sun’s energy back into the atmosphere. This lowers the temperature and helps cool the rest of the house down. As a result, your use of air conditioning will decrease which will lower your electricity bill. How Does Uncle Sam Feel? Not only is metal roofing a great idea when it comes to lowering your energy bill, it will also make Uncle Sam happy! If you purchase the correct type of metal roofing for your house, you could be entitled to a $500 tax credit. This is great news for those who already see the value in using metal roofing instead of asphalt. In order to find out how to qualify, speak with a roofing contractor. While composition roofing remains the most common type of roofing, it is clear that the benefits of metal roofing are far more extensive than its asphalt counterpart. If you would like to save more money over the long term, you should speak with a roofing contractor who handles residential roofing in Menlo Park, CA.